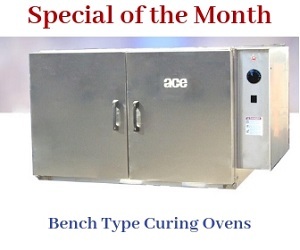 The ACE Burn Off Oven Model 3336 RT is designed to survive harsh work environments. This oven utilizes 20% less energy compared to over convection-only Burn-off ovens. This oven is made from durable 11 gauge steel, and is designed to remove hydrocarbons, varnish, and paint from metals. This oven features an automatic self-adjusting One Touch Control (OTC) system. The OTC monitors the combustible vapors in the system, and keeps it at a safe level. The OTC does not require an experienced operator for menu selection, or for estimating the combustible load in the system. The oven is painted with blue enamel high temperature, and rust resistant paint, which ensures its performance for long time periods. Volume Over Cart 328 CU. FT.
1 Top Mounted Pressure Relief Hatch 27.0 SQ. FT.